Modern living styles are all the rage now and there are years of thinking behind this so civilized and elegant modern living! Due to unreasonable increase in population, the world is going short on living space and to overcome this issue people has started building double, triple and multi-storey homes! Both top and ground floors of these double or triple storey homes are always linked together with elegant interior stairways and we are all well familiar to them for sure! So white going upstairs, your baby which has recently started crawling, can chase you and it may be very risky and may cause serious injuries! 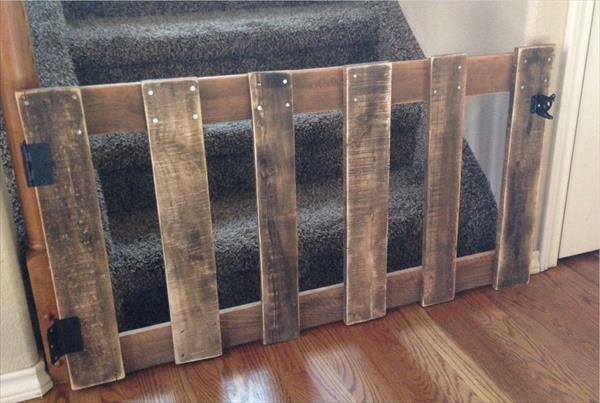 So as a solution to this problem, one can get this DIY wood pallet baby gate, which is free of cost and has height level which would be impossible to cross over by your crawling baby! Get a pallet board with removed dice section and get this sturdy baby gate though a little readjustments and modifications! Build it in your desired measured dimensions to fit best to your stairway and get a security barrier for your baby at no-cost budget plan!